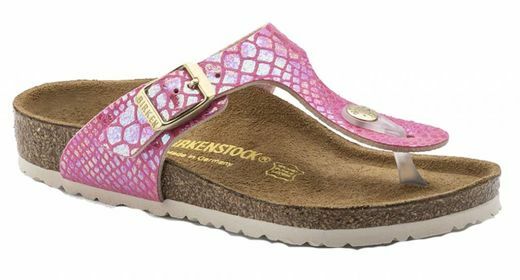 The Gizeh shiny snake pink is a nice T-bar sandal with a snake print in a beautiful rose colour. The straps are made of Birko-Flor with a soft felt lining. The snake print has a soft glow; hence the name ‘shiny snake’. This pink coloured version is ultimately girly and combines easily with fun outfits. The gold-coloured buckle and push-button on the T-bar complete the picture. The sandal has a white EVA sole ensuring shock absorption during walking. The anatomically shaped Birkenstock cork foot bed with suede top layer gives optimal support to the feet. 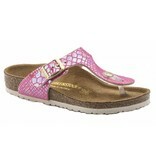 The Gizeh kids shiny snake pink is available in the width ‘normal’.